Guadalupe River Vacation Rental #13106 LakeHouseVacations.com Rent Me! This listing is for two separate homes on beautiful River Road, both with private Guadalupe River Access! Southern Comfort is a brand new build with 4 bedrooms, 3 bathrooms, and sleeps 16 guests. Right across the street is The Lazy A, a cozy 3 bedroom, 1.5 bathroom home that sleeps 12 guests. With both homes, you can have up to 28 guests! These homes are located a door down from Bezdek's, which is the perfect place to rent tubes and float away! There is entertainment for all up and down river road. Just a short drive to Gruene and downtown New Braunfels, which both offer fine dining establishments, entertainment, and numerous activities. Gruene Hall is the oldest dance hall in Texas and a famous landmark. Gruene also offers great shopping, restaurants and wine tasting. Close to the outlet malls, Schlitterbahn and Canyon Lake. Newly built 2000 sq. ft. home between the 2nd and 3rd Crossing of the Guadalupe River. Before stepping foot in the house, you'll know that this is the place to be with a a fire pit in the yard and walkway leading directly into the river. The home sits proudly atop piers with outdoor staircase leading to the porch overlooking the water. The ground under the home is open air with spots for parking. The upstairs porch boasts 180 degree view of the river, and full length sliding glass doors open up into the grand room of the house. The grand room has vaulted 18 ft. ceilings with windows all around. This open concept living area has all the comforts of home! The kitchen has all new appliances and comes fully stocked with cookware, dishes, and utensils. The dining table is perfect for you and your guests sharing a meal together after a day spent on the water! There's lots of space to recharge at the end of the day. The first master bedroom is right off the living room with king size bed, private porch access, river view, and en suite bathroom. The first master bath has a double sink, walk in shower, and large closet. Past the grand room lies the rest of the rooms. The first guest room has a full over full bunk bed as well as a twin over twin bunk. The second guest room has 2 queen beds. Both guest rooms have river views as well. The guest bathroom with a tub/shower combo is conveniently located by both guest rooms and near the living area. The second master bedroom has a king bed and twin bunk beds. This master room also has a private bathroom with a tub/shower combo. There is a sofa sleeper in the living room as well. All bathrooms come stocked with hotel size amenities, towels, and two rolls of toilet paper. High quality linens are provided for all beds and bathrooms. Large deck on the front of the house affords great views of the Guadalupe River. 40 ft of private riverfront property is perfect for spending the day swimming, kayaking, tubing and relaxing. Home sits on a 1/2 acre of fenced in land giving privacy and plenty of room for outdoor activities. kayak with paddle included for guest use. 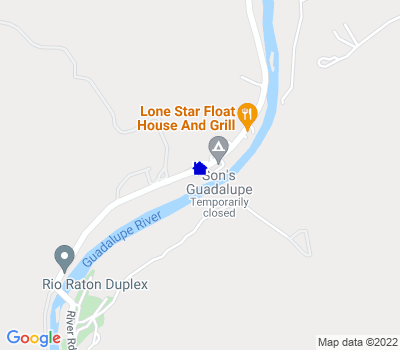 Private Guadalupe riverfront property is across the street 200 ft from the house and includes a large stone patio a few feet from the river. Patio is perfect for setting up canopies and chairs and spending the day. Six stone steps at river edge allow for an easy walking entrance into river. This location on river is perfect for wading, swimming, floating in a tube or just relaxing as you watch others float by. Home is fully furnished with an open kitchen/dining/living room which include many extra amenities. Large island for extra seating in the full kitchen which includes dishes, all appliances and cookware.Living room has 2 recliners and 2 futons, flat screen HD TV, DVD, and VCR. House has WiFi and cable, as well as a gas and charcoal grill. Guests must be 25 years of age or older to make a reservation and must be staying at the property. No pets allowed.